Dr. Simone Alin is a Supervisory Oceanographer at NOAA’s Pacific Marine Environmental Laboratory in Seattle and an Affiliate Associate Professor in the University of Washington School of Oceanography. Her research focuses on ocean acidification and other carbon cycle issues in coastal waters on the U.S. West Coast and in Puget Sound. In 2016, she led the planning and execution of the fifth NOAA West Coast Ocean Acidification research cruise, which extended from Baja California to British Columbia. When on land, Simone is actively involved with planning and implementing observing networks for the global carbon cycle, as well as leadership committees for national and international data synthesis and visualization efforts focused on ocean carbon and ecosystem issues. She has served on the U.s. national science steering committees for the North American Carbon Program, the Ocean Carbon and Biogeochemistry Program, and its Ocean Acidification Committee. She is the Global Coastal Oceans leader on the international Surface Ocean CO2 Atlas (SOCAT) project, and she was an alternate member on the Washington State Governors' Blue Ribbon Panel on Ocean Acidification in 2012. Dr. Alin is also passionate about helping the public and policy makers connect the dots about effects of human-caused CO2 emissions on ecosystems and society through novel graphics and narratives focused on ocean carbon and ecosystem issues through collaborations with a variety of partners. Simone received her bachelor’s degree in biology from Stanford University and earned her PhD in Geosciences with a minor in Ecology & Evolutionary Biology from the University of Arizona. 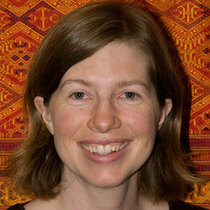 She completed postdoctoral research at the University of Minnesota Large Lakes Observatory and the University of Washington School of Oceanography as a NOAA Climate and Global Change Postdoctoral Fellow.